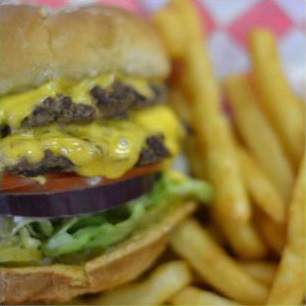 Family owned and operated Captain Billy Whizzbang’s best burgers in Waco, Texas has been providing the best burger since 1977. Our meat is delivered fresh each morning from a local meat market and each hamburger patty is hand-pressed, never frozen, and made to order just how you like and remember from the good old days. 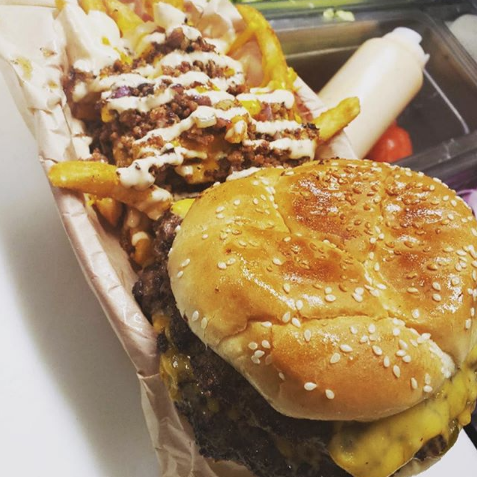 Waco locals, tourists, and Baylor students are all a fan of Captain Billy Whizzbangs’ signature Whizz-Pigg burger made with half ground bacon and half ground beef with all the fixings for you to choose. 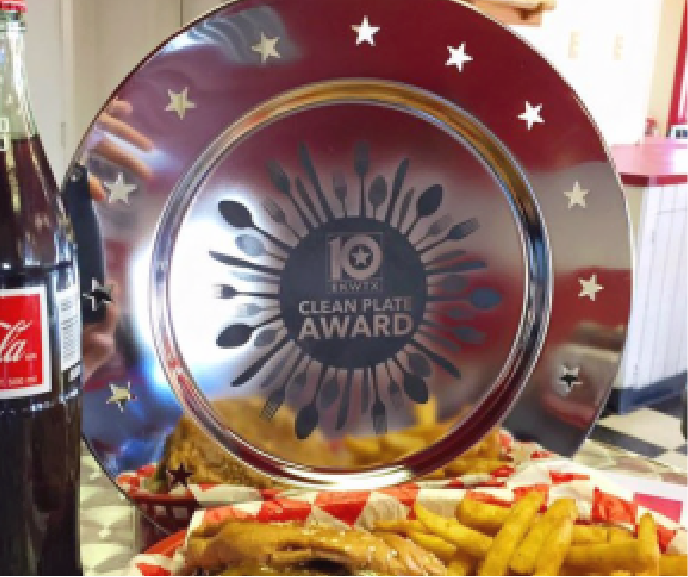 We pride ourselves on a clean and inviting environment that you will be proud to bring your friends and family to. Dine in, drive through, or pick up we are looking forward to seeing you! Captain Billy Whizzbang made his fateful attempt for fame and glory on the morning of July 4, 1905, in San Francisco. Before a crowd of 5,000 people, Captain Billy boarded his giant balloon, The Wicked Windbanger, waved to the crowd, lifted slowly, but deliberately off the ground, and started his magnificent, grueling, and dangerous attempt to soar majestically nonstop across the continent to New York City. The crowd scoffed and laughed (some cheered) at such a ridiculous feat, but if successful, our brave Captain Billy would become as famous and immortal as Red Barron, Billy Mitchell, Charles Lindbergh, and Captain Doolittle. 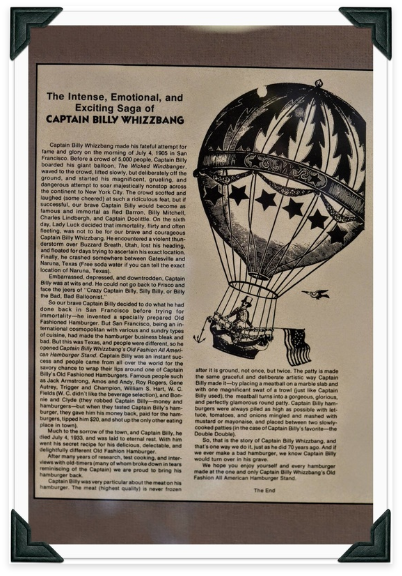 On the sixth day, Lady Luck decided that immortality, flirty and often fleeting, was not to be for our brave and courageous Captain Billy Whizzbang. He encountered a violent thunderstorm over Buzzard Breath, Utah, lost his heading, and floated for days trying to ascertain his exact location. Finally, he crashed somewhere between Gatesville and Naruna, Texas (Free soda water if you can tell the exact location of Naruna, Texas). So our brave Captain Billy decided to do what he had done back in San Francisco before trying for immortality—he invented a specially prepared Old Fashioned Hamburger. But San Francisco, being an international cosmopolitan with various and sundry types of cuisine, had made the hamburger business bleak and bad. 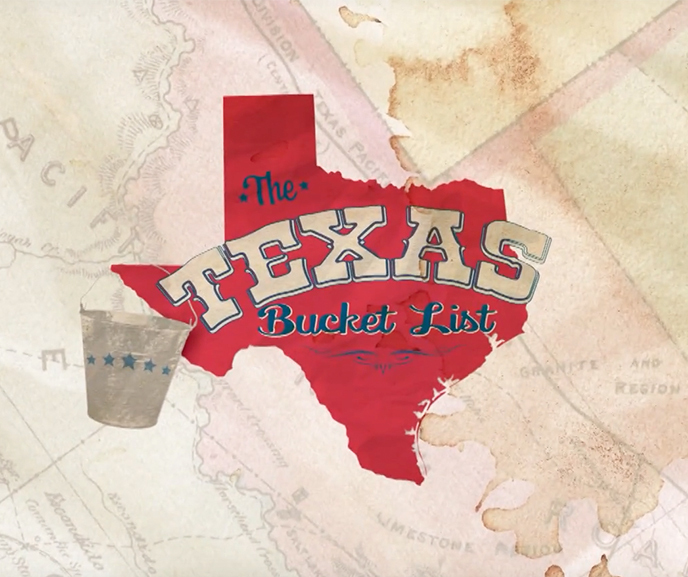 But this was Texas, and people were different, so he opened Captain Billy Whizzbang’s Old Fashion All American Hamburger Stand. Captain Billy was an instant success and people came from all over the world for the savory chance to wrap their lips around one of Captain Billy’s Old Fashioned Hamburgers. Famous people such as Jack Armstrong, Amos and Andy, Roy Rogers, Gene Autrey, Trigger and Champion, William S. Hart, W. C. Fields (W. C. didn’t like the beverage selection), and Bonnie and Clyde (they robbed Captain Billy—money and hamburgers—but when they tasted Captain Billy’s hamburger, they gave him his money back, paid for the hamburgers, tipped him $20, and shot up the only other eating place in town). Much to the sorrow of the town, and Captain Billy, he died July 4, 1933, and was laid to eternal rest. With him went his secret recipe for his delicious, delectable, and delightfully Old Fashion Hamburger. After many years of research, test cooking, and interviews with old-timers (many of whom broke down in tears reminiscing of the Captain) we are proud to bring this hamburger back. Captain Billy was very particular about the meat on his hamburger. The meat (highest quality) is never frozen after it is ground, not once, but twice. The patty is made the same graceful and deliberate artistic way Captain Billy made it—by placing a meatball on a marble slab and with one magnificent swat of a trowl (just like Captain Billy used), the meatball turns into a gorgeous, glorious, and perfectly glamorous round patty. Captain Billy hamburgers were always piled as high as possible with lettuce, tomatoes, and onions mingled and mashed with mustard or mayonnaise, and placed between two slowly-cooked patties (in the case of Captain Billy’s favorite—the Double Double). So, that is the story of Captain Billy Whizzbang, and that’s one way we do it, just as he did 70 years ago. And if we ever make a bad hamburger, we know Captain Billy would turn over in his grave. We hope you enjoy yourself and every hamburger made at the one and only Captain Billy Whizzbang’s Old Fashion All American Hamburger Stand. see this framed at Whizzbangs! 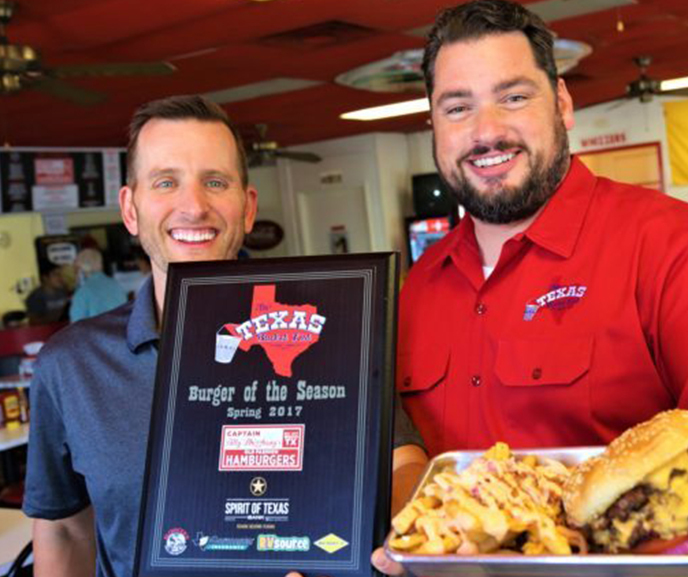 "I saw this place on The Texas Bucket List, they won burger of the season, and IMO that did not give them enough credit. This was a great burger." "Had my first burger at Captain Billy Whizzbangs today. Half bacon half beef patties = genius. My life will never be the same." "Recently visited this place....and I'll admit I've been there three times in the last two weeks!! ABSOLUTELY LOVE IT!!" 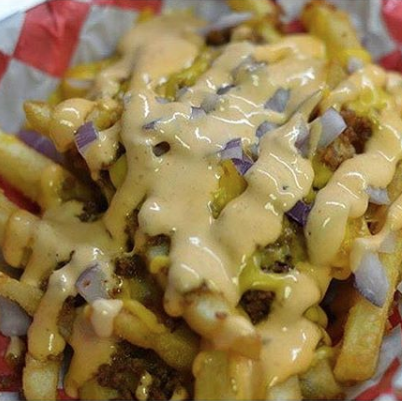 "The best place in Waco to get a bacon double cheeseburger and the fries are awesome!" (c) 2018 Whizzbang’s. All Rights Reserved.